The San Luis Obispo firm Vellum Design Build and Cal Poly’s College of Architecture and Environmental Design partnered to host the 15th annual Vellum Furniture Design Exhibition, a juried competition among students of the college. Vellum Design Build and the College of Architecture and Environmental Design (CAED) initiated almost a decade ago (2004) a design competition and exhibition that encourages participants - mostly students, from the California Polytechnic State University, Cal Poly, San Luis Obispo - to create original furniture designs and have their submissions juried by a panel of experts in their field. Intended to inspire creative thought and challenge participants to press the boundaries of design, the Vellum Competition offers a tangible experience and exposure to the industry. Every year, Vellum and the CAED host a public reception during the fall quarter in a prominent location in downtown San Luis Obispo. A silent auction to benefit the emerging designers typically accompanies the event. Competition Winners received a number of awards ranging from the Best of Show: Vellum Prize; Runner's up; People's Choice; and Best Production Value. A panel of judges is comprised of artists, furniture designers, architects, CAED faculty members, and laureates which have included: Joshua Aidlin, Robert Arens, Jory Brigham, Bruce Bolander, Chris Deam, TJ Esser, Eric Pfeiffer, George Garcia, Joanna Gawunder, Matthew Granelli, Tricia Hamachai, Mark Horton, Tim Kobe, Laura Joines-Novotny, Hugo Martinez, Whitney Moon, Hilary Nagler, Mark Rawson, Jonathan Reich, Larissa Sand, Jill Salisbury, Dawn Sherry, Joey Shimoda, Colin Sprenkle, Craig Steely, and Len Wujcik. Two publications by AEDPress have been released showcasing student work celebrating five and seven years of Vellum excellence. Vellum_7: Seven Years of the Vellum Furniture Competition, a publication to document and display a small cross-section of the furniture and constructions conceived and fabricated in the context of this annual design competition held in San Luis Obispo for five years running. The Vellum Furniture Competition, now entering it’s ninth year, has been a collaborative effort between the community and the College of Architecture + Environmental Design - - most notably, the Architecture Department, architect Tom di Santo and local design-build and retail outfit Vellum Inc.
Vellum_5: Five Years of the Vellum Furniture Competition, a publication to document and display a small cross-section of the furniture and constructions conceived and fabricated in the context of this annual design competition held in San Luis Obispo for five years running. 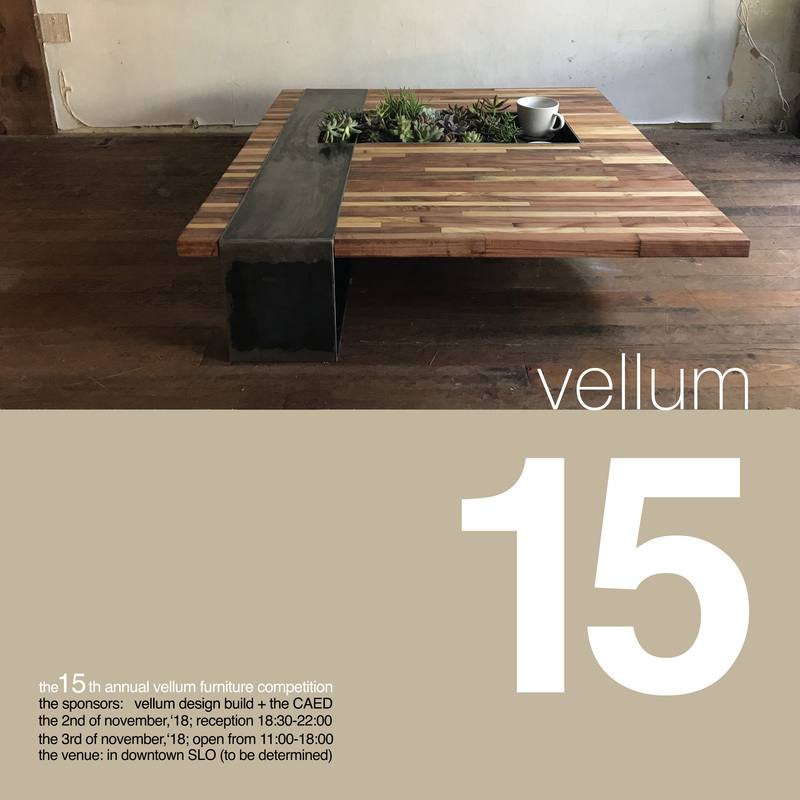 The Vellum Furniture Competition, now entering it’s sixth year, has been a collaborative effort between the community and the College of Architecture + Environmental Design - - most notably, the Architecture Department, architect Tom di Santo and local design-build and retail outfit Vellum Inc. The publication is part of the Architectural Environmental Design Press (AEDPress) and can be purchased from Lulu Marketplace (112 pages, color, paperback).